German Chicken Schnitzel recipe. This is a grandma recipe so you know it’s going to be good. This easy meal only takes 15 minutes! Make sure to serve with classic German sides like potato salad, sauerkraut and spaetzle. This is a German grandma recipe so you know it’s going to be good. Make sure to serve with classic German side dishes – preferably potato salad, mashed potatoes and sauerkraut. And you need to add a squirt of fresh lemon on top! You know that quote, if a tree falls in the forest does anyone hear it? Well did you even eat schnitzel if you don’t add lemon on top? If you’ve never had schnitzel then prepare yourself! Your taste buds are in for a culinary treat! 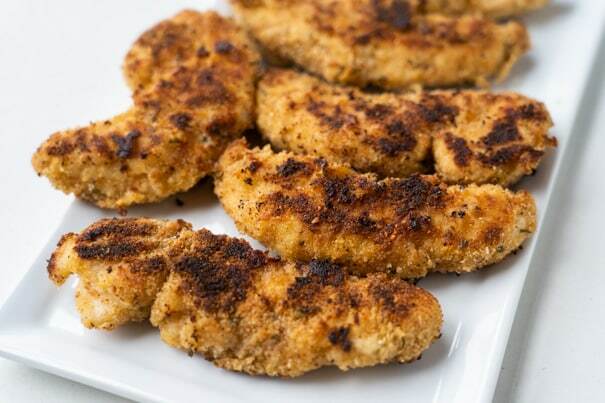 Schnitzel is a thin meat that is coated with flour, eggs and bread crumbs and then fried to become crispy. It’s usually served as a main dish, with German side dishes. 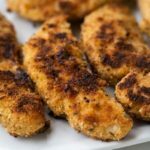 Pork is popular when it comes to making German schnitzel but my family prefers chicken for dinner, so I decided I was going to use Chicken Tenderloins for this recipe. This results in a less fatty meal, and I like the small proportions that tenderloins give you – easier for serving the entire family. Now let’s make one of my favorite German meals! 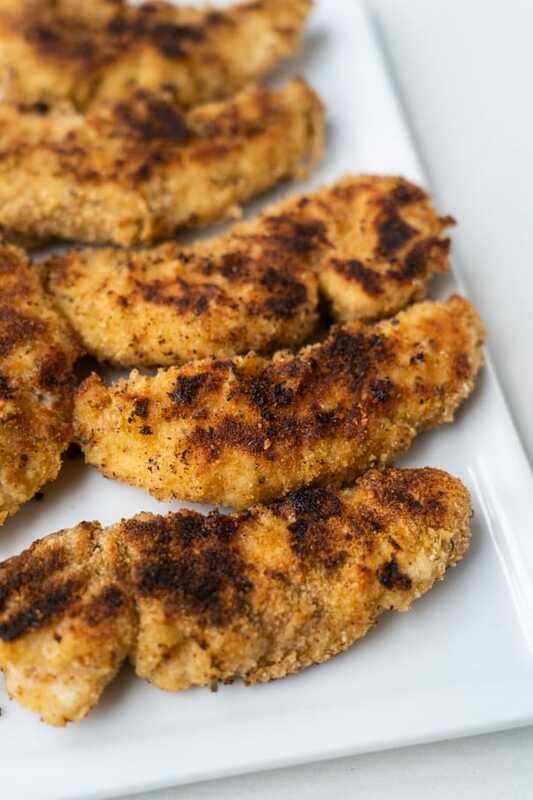 Put the tenderloins in a shallow pan filled with all purpose flour. Flip the chicken so it’s coated with flour on both sides. Now crack 2 eggs in a bowl or pan, and add some salt and pepper for flavor. Use a fork and gently beat the eggs, like you would do for scrambled eggs. Now add your chicken to it. The flour prior to this is going to keep to make sure the egg sticks on it. Flip to the other side to fully coat the chicken in eggs. Now the fun part – bread crumbs! 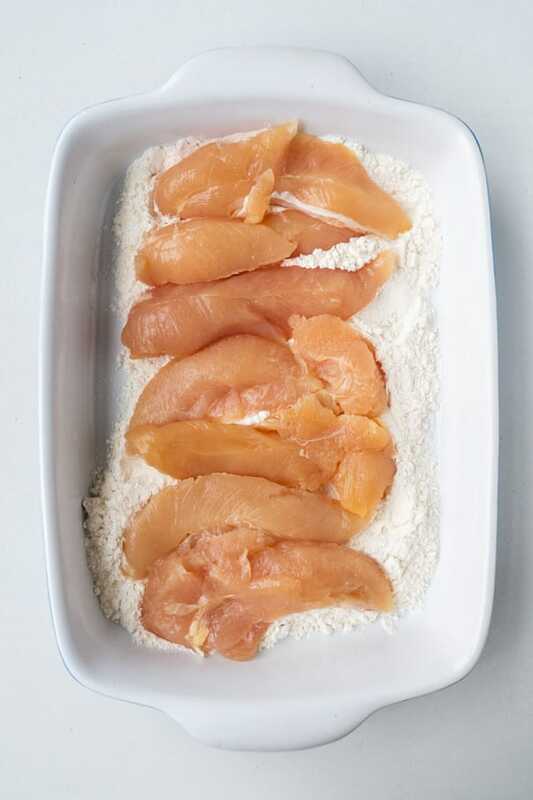 This is going to make the chicken crispy – just like schnitzel should be! 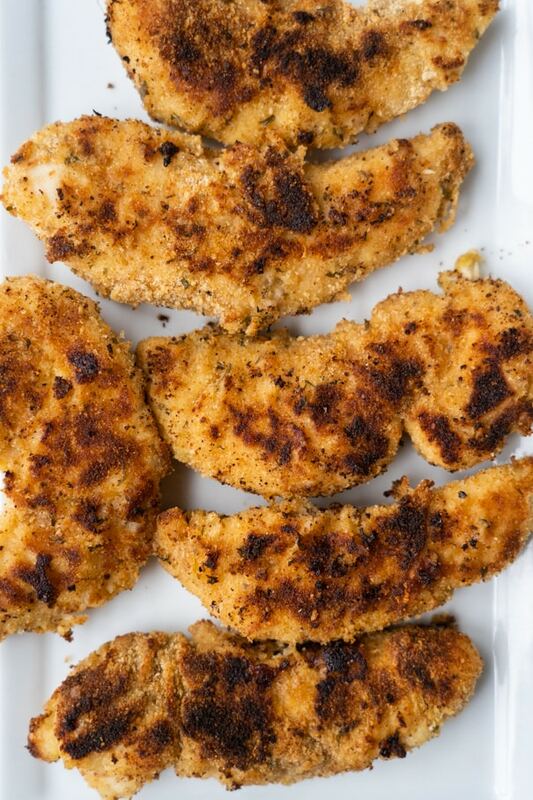 You can use plain bread crumbs or Italian seasoning panko crumbs. I usually have the Italian version in my pantry so I used that – it adds some extra flavor too! 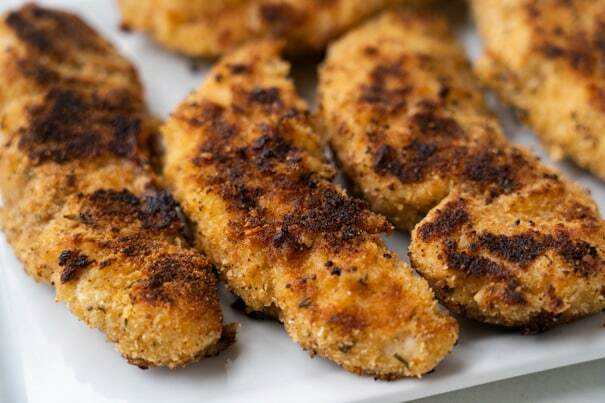 One at a time, put the chicken in the bread crumbs, mixing the chicken around so it’s fully coated in bread crumbs. Make sure it’s coated completely – all sides and all nooks and crannies! Now that they have their bread crumbs, time to cook them! 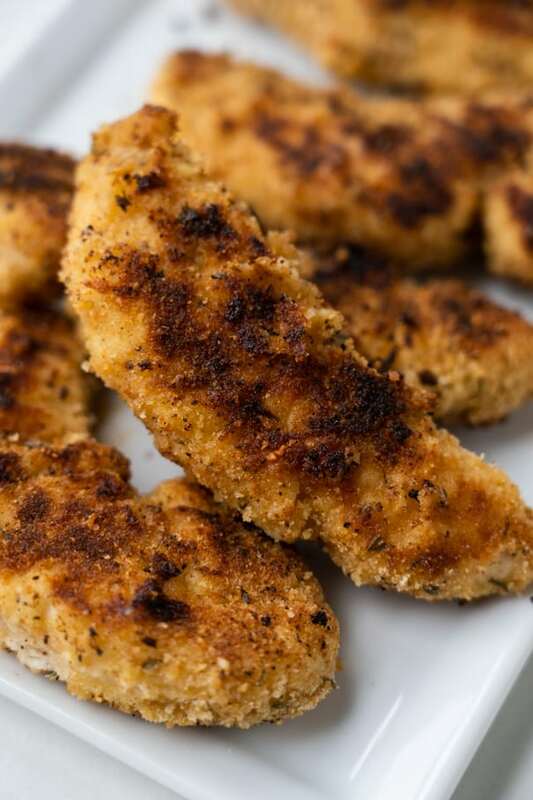 What is the best way to cook chicken schnitzel? 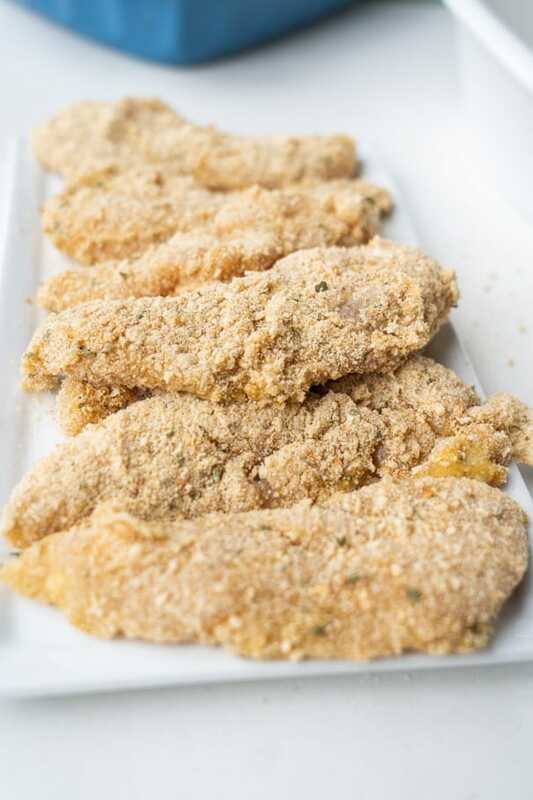 Frying them in a little bit of oil is the best way to get crispy and authentic chicken schnitzel. 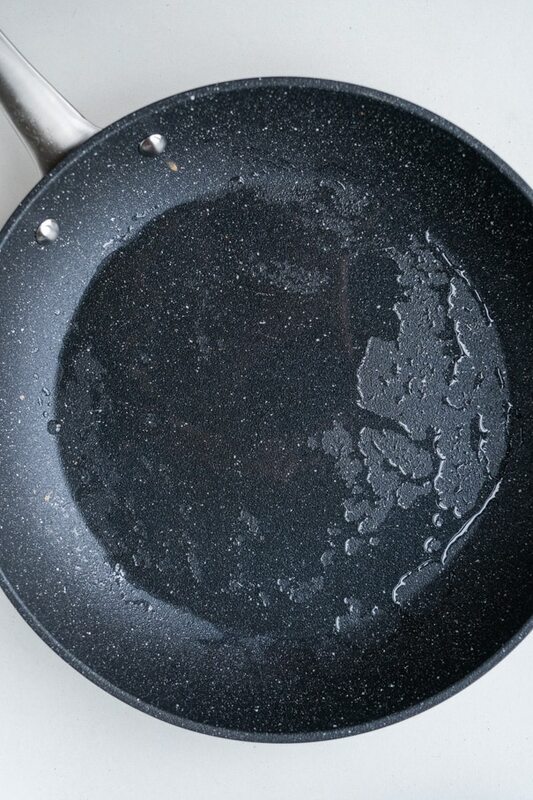 Using a large frying pan, coat lightly in olive oil. 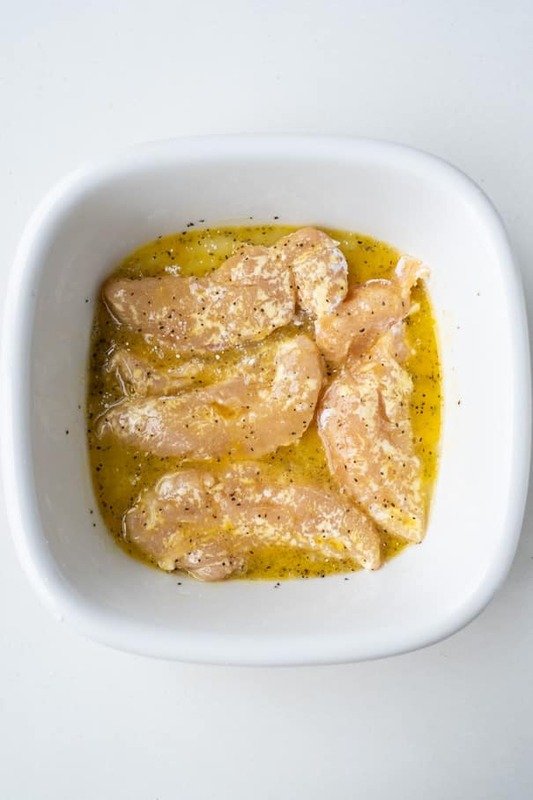 The olive oil is going to help us fry the chicken. Once the pan is heated up, add chicken and cook on both sides, until browned, crisp and the internal temperature reaches 165 degrees. This will take about 10 minutes. And just like you have authentic Chicken Schnitzel to eat! Grab a plate and a fork! I guess you could share it with your family too! I love that each piece is crispy and full of flavor. 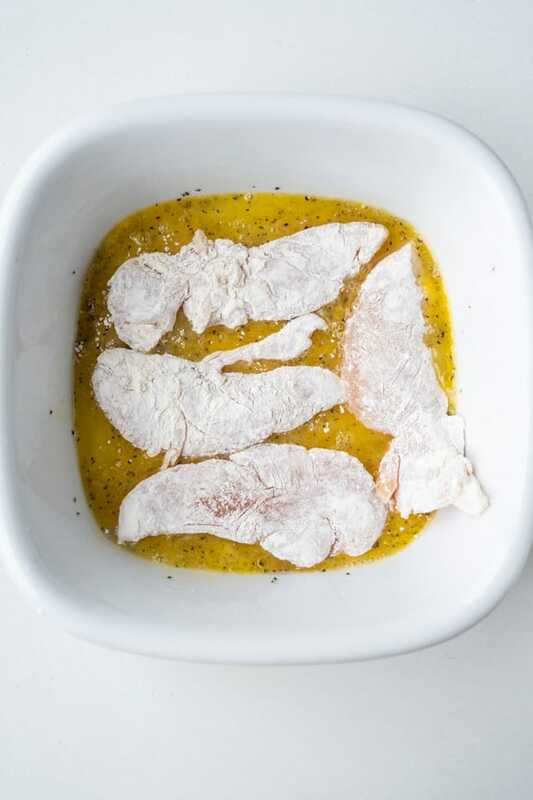 By using quality chicken tenderloins, the meat will be be juicy and full of flavor! This Chicken Schnitzel is a big hit in my house. Not only do I love it, but my husband and toddler daughter always ask for seconds too! Ok, I lied, my husband asks for thirds. 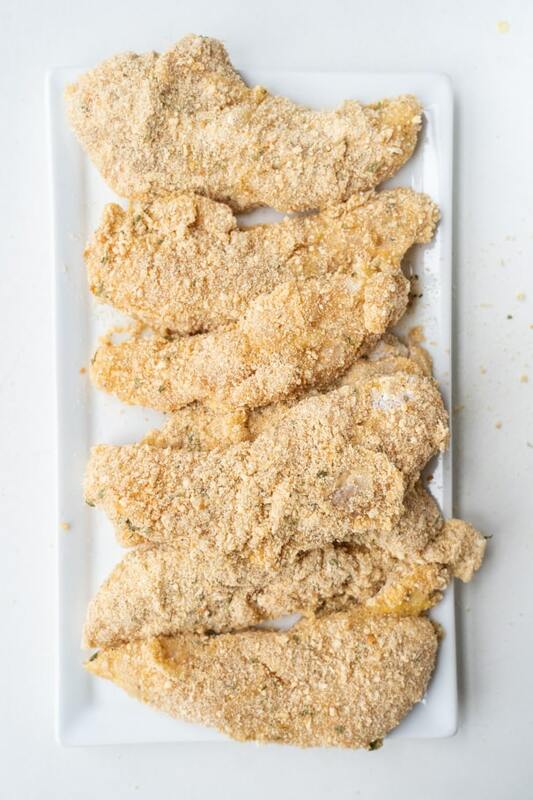 If you try this Chicken Schnitzel recipe, please leave a comment or share it on Instagram with tag #brooklynfarmgirl – I’m always looking for photos to feature and share! 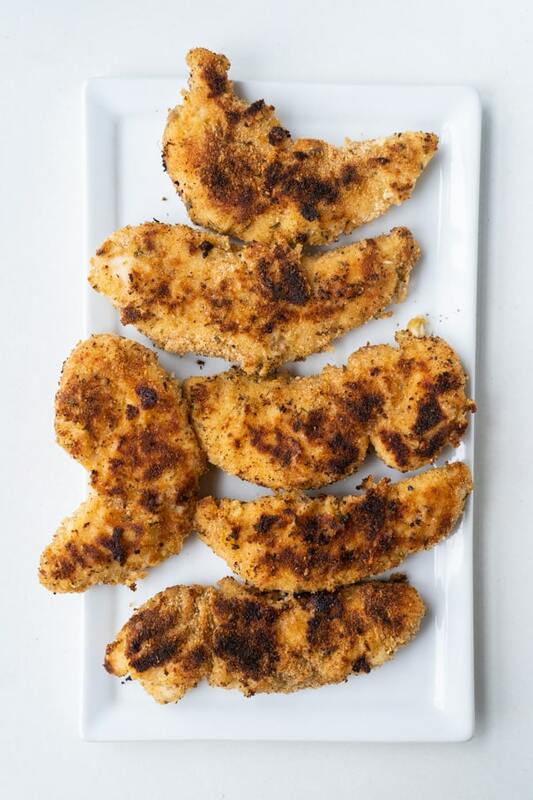 German Chicken Schnitzel recipe. 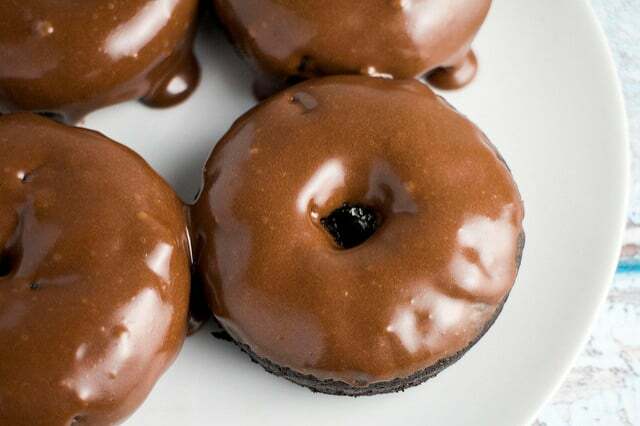 This is a grandma recipe so you know it's going to be good. This easy meal only takes 15 minutes! Make sure to serve with classic German sides like potato salad, sauerkraut and spaetzle. 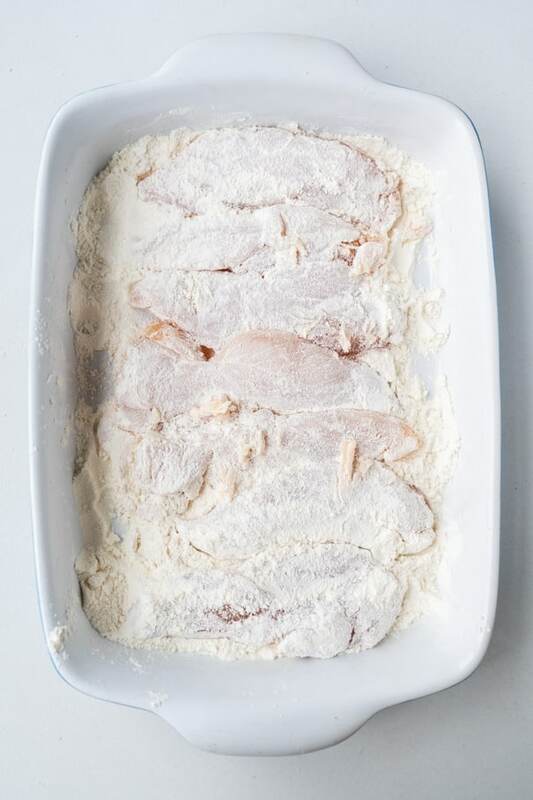 Put the chicken tenderloins in a shallow pan filled with all purpose flour. Flip the chicken so it's coated with flour on both sides. 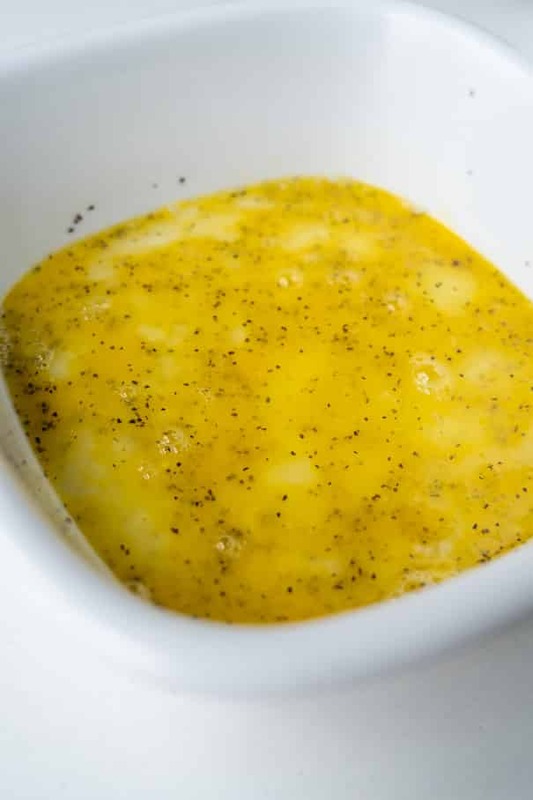 Crack 2 eggs in a bowl or pan, add vegetable oil, and a little bit of salt and pepper for flavor. Use a fork and gently beat the eggs, like you would do for scrambled eggs. Add your chicken to it. Flip to the other side to fully coat the chicken in eggs. Add bread crumbs to a bowl. 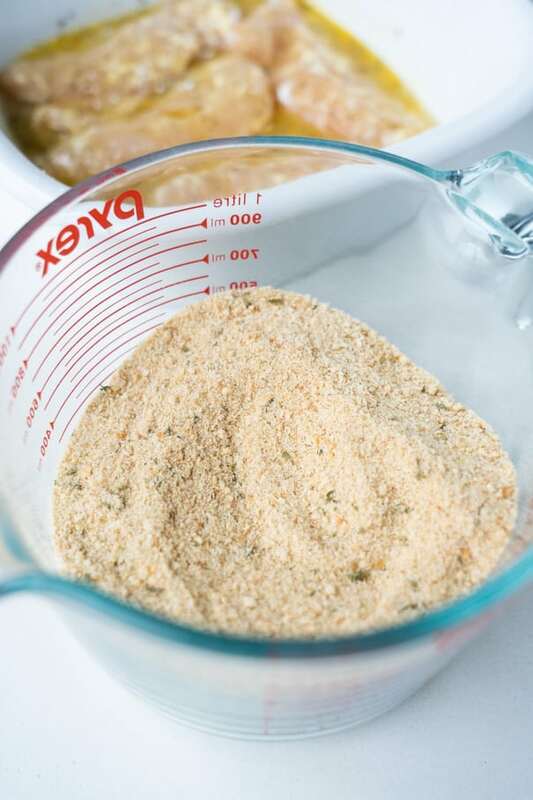 One at a time, put the chicken in the bread crumbs, mixing the chicken around so it's fully coated in bread crumbs. Make sure it's coated completely - all sides and all nooks and crannies! Using a large pan, coat lightly in olive oil. The olive oil is going to help us fry the chicken. Serve on plates with German sides, like potato salad, sauerkraut and spaetzle. Take a fresh lemon and give a little squeeze on top of your chicken schnitzel! Enjoy!